Naan bread is a staple in South Asia where it is cooked in a tandoor oven. The oven is made of clay and is heated to an extremely high temperature of 900°F. I can not even imagine how hot that would feel. The dough is slapped up against the sides of the tandoor and the high heat causes big bubbles to form in the dough giving it a distinctive texture and lumpy appearance. 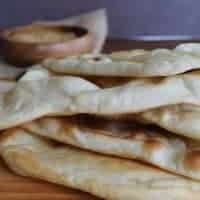 Although you can buy naan bread in most grocery stores our home ovens work really well in creating this wonderful flat bread. As I tear off a piece of this warm, soft delicacy and slather it in butter, pop it in my mouth I am addicted! This is going to taste so good dipped in the spicy tomato sauce of my Moroccan lamb meatballs. 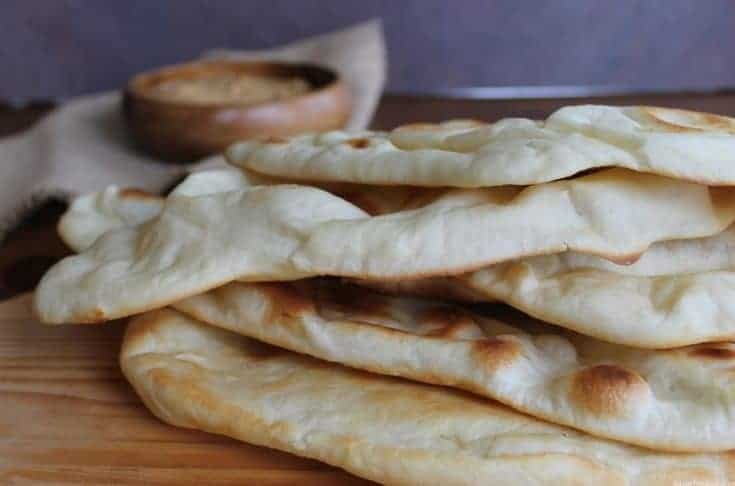 This soft, thick and airy flat bread that is served at Indian restaurants is easy to bake at home and is incredibly delicious. 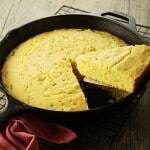 It can be used as a scoop for sauces or other foods, slathered with hummus or made into a sandwich. Place all the ingredients in a mixing bowl and stir until the dough forms a lumpy ball. Cover the bowl with plastic wrap and let the dough sit for 10-15 minutes. Remove the cover and either by hand or with a stand mixer, kneed the dough for about 10 minutes until it is smooth and satiny. Place the dough in a greased bowl. Oil the top of the bowl and cover with a cloth or plastic wrap. Let the dough sit in a warm draft free place for 1 -2 hours until doubled in size. Place a pizza stone in the oven (if you have one) and pre-heat the oven to 475°. Divide the dough into 10 pieces. Roll each piece of dough into an oval about 1/8 to ¼ inch thick then cover and let rest 20 to 30 minutes while the oven and pizza stone heat up. 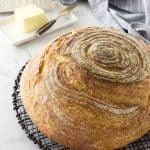 Place 2 breads at a time on the hot pizza stone and bake for 2 minutes then turn and bake for 2 minutes on the other side. Cool on a wire rack and brush with melted butter. A baking sheet works well if you do not have a pizza stone..